Cannot wait to see this. 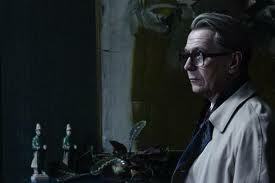 Tinker Tailor Soldier Spy is the chillingly stylish screen adaptation of John le Carré’s much celebrated British spy novel. The story centres around disgraced British spy George Smiley who is lured out of spy retirement to track down a suspected Soviet mole. Much sneaky sleuthy double-dealing ensues. The cast is packed full of British gems including Gary Oldman, Colin Firth, Mark Strong and Tom Hardy (lord serve him up to me on a plate.. allow the creepy blonde mop) and the 70s styling is impeccable. I love a bit of espionage. The word literally makes me tremble. When I was growing up my dad was always telling me I should set my sights on MI5 (must be my inherently devious nature). I had a good old go at the online application form a few years ago… 40 mins later, I was defeated. That thing is LONG! Check the super slick trailer and get excited.